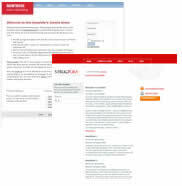 CMS Lounge have released two new Joomla themes for March called Structura and Tem_montrose. As with all themes released by CMS Lounge both are very clean, quick loading and easy on the eye. Tem_montrose is a two-column design with a light and classy feel. They designed this theme with the idea of a small company in mind because it portrays a message of simplicity and robustness. Structura has a font-resizing utility plus several buttons and icons that can be used for various purposes; it's also very clean and fast loading and comes with what you'd expect from CMS Lounge. Click here for more information or to view live a live demo of either site.